To be a successful baker we must be mindful, fully focused on the task in hand, ignoring all other distractions. We need to approach the recipe with a ‘beginners mind’ without assuming things will go totally to plan. 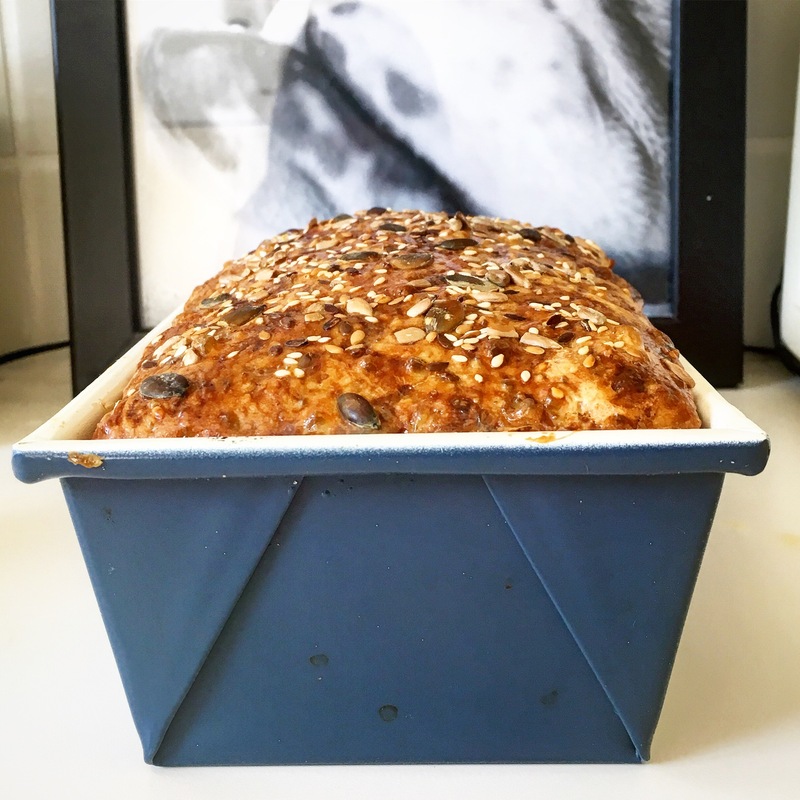 Many variables can affect the outcome of a recipe, you may be using a new oven therefore the temperature may cause difference in cooking times. When baking bread the air temperature and the humidity will have an affect on the outcome and so rising times will change. If we’re making pastry we need cold hands and cold conditions or we’ll have to allow extra time for the pastry to rest in the fridge. Nothing is certain, which is why we must focus and give all our attention to the task and be ready to adapt and change! If you’ve ever baked with a child they are an excellent example of what it means to have a beginners mind. For them it’s all about the experience, they are eager to watch and observe and focus on the task. They don’t have any preconceptions about how the recipe should turn out. The end result is just one tiny aspect, they are enjoying the activity, in fact as long as something vaguely edible comes out at the end then they’re usually thrilled. We should learn from them in this respect, try to enjoy the act of baking or cooking, the result being just one of the many benefits. No rushing through or getting annoyed or frustrated. Just slowly, methodically working through the recipe while our mind is free of all the anxieties and worries about the future. One of the things I love about baking is the speed. It’s a slow activity, it can’t be rushed and therefore what you produce becomes more special, something to be shared and cherished. The emergence of fast food and processed meals which were created to make eating and cooking much quicker and more convenient, has remove the need for most people to learn how to cook. However with this we’ve lost all the joy of creating a meal, the skill of learning to cook and the enjoyment of cooking for others. Most importantly we have been relying on foods filled with preservative and additives, that have disastrous consequences for our health. Much like how the mass production of motorised transport may have sped up our commuting time but the cost is that we have lost the advantages gained from waking, the exercise and health benefits have been foregone. While for some journeys it is essential to travel by car, train or plane there are also many that we could do by foot. That quick pop to the corner shop for a pint of milk or 5 minute journey to collect the children from school. From my own personal experience when I lived in London I always got the tube when really I could have walked. I became frustrated and impatient when I had to wait for a train or it became delayed. Really I should have been above ground walking, in the fresh air and getting some exercise. Luckily now people are rediscovering their love of cooking and the creative aspect of baking and meal planning. We’re starting to understand the health benefits of cooking from scratch and the negative impact that mass produced food can have on our mental and physical health. 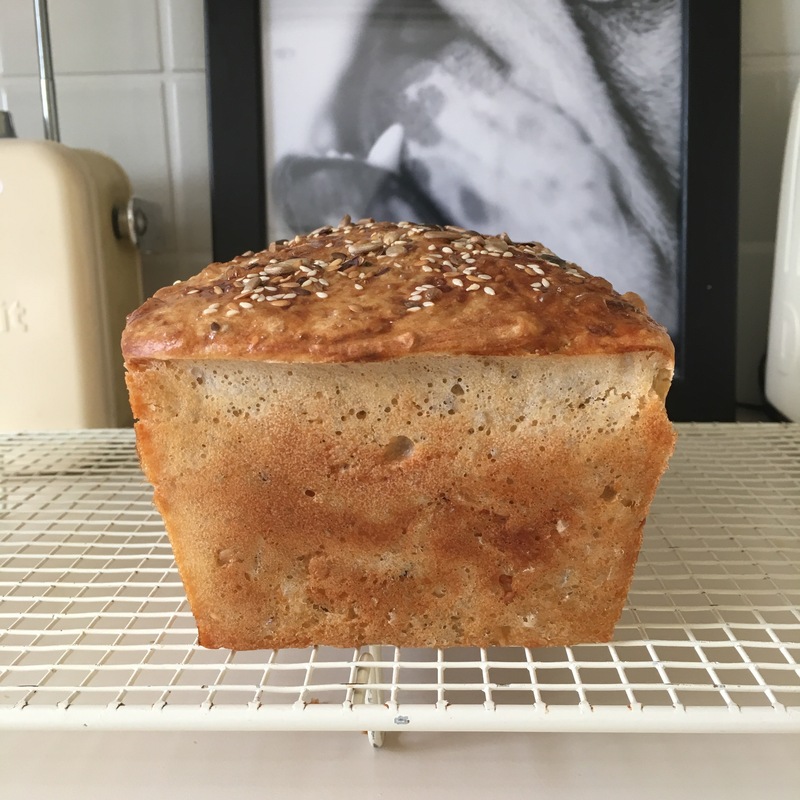 It’s the perfect time to start combining mindfulness, baking and cooking healthy meals. So try it today, start with this recipe and while you cook let your mind become filled with the task in hand. Live for the moment and enjoy the process and know that you’re achieving something amazing, even if you’re feeling anxious or depressed, you can create something nourishing and healthy for you and others around you. What a gift that is, feeding yourself and others well is the ultimate example of love and respect for our bodies. 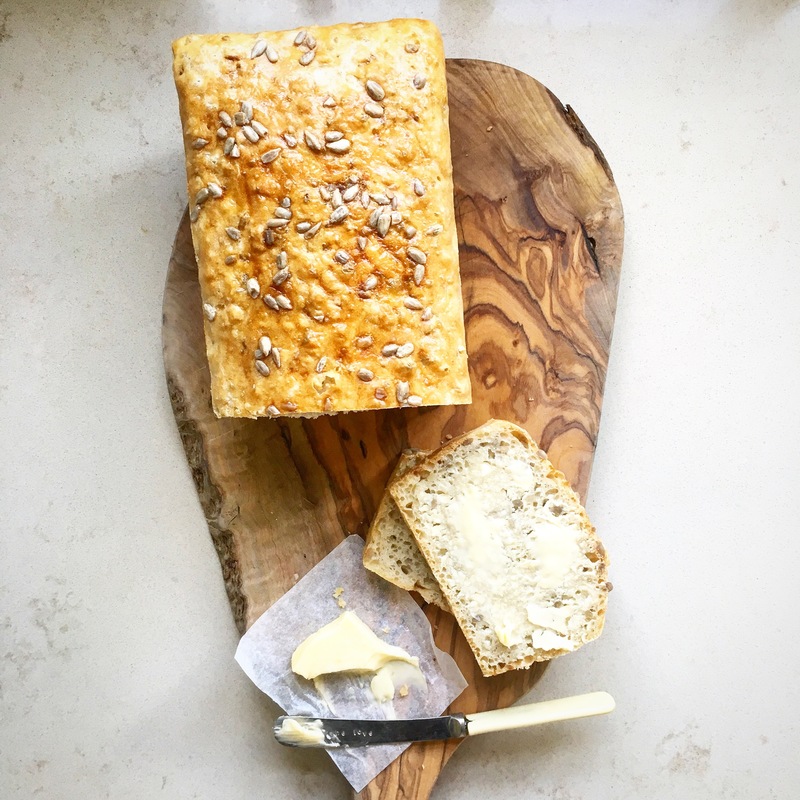 The recipe below is one of the simplest breads you can make, it has only one rise and requires no kneading and no special equipment. 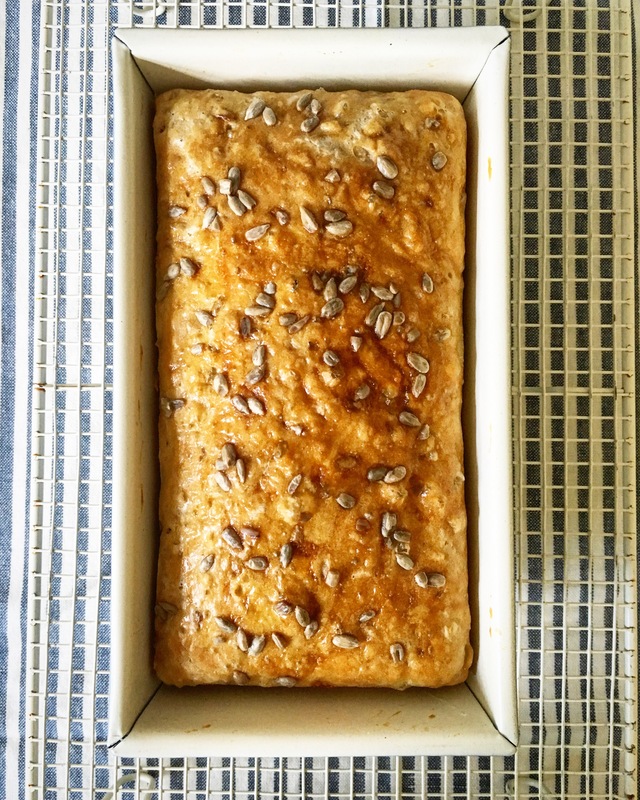 I’ve adapted this recipe from a really good book I’ve been reading recently called “the Art of Mindful Baking” by Julia Ponsonby. 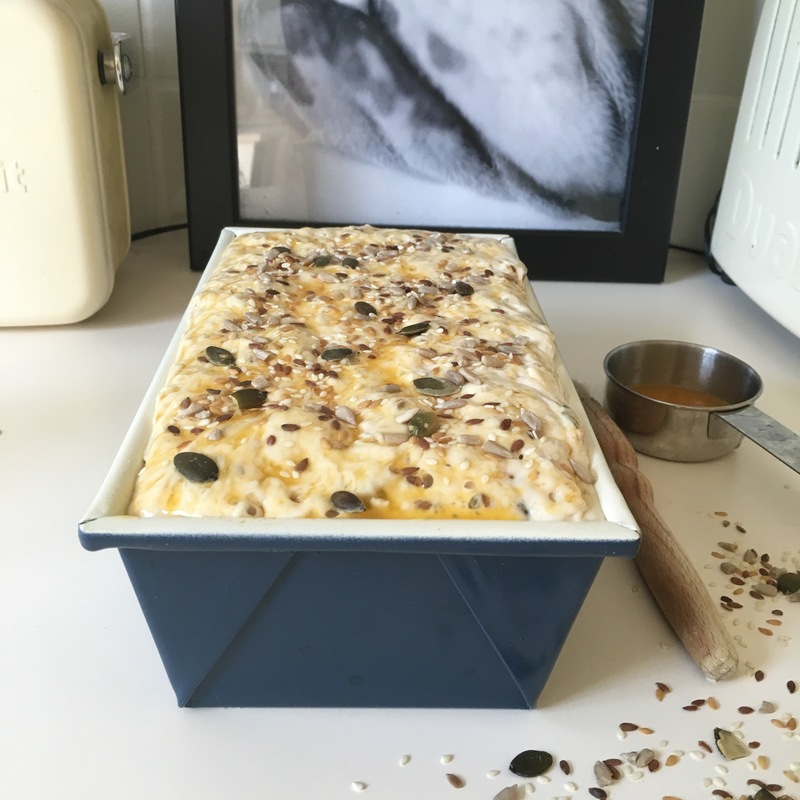 If you’re reading this blog as an anxiety sufferer who has never tried baking before please have a go at this. 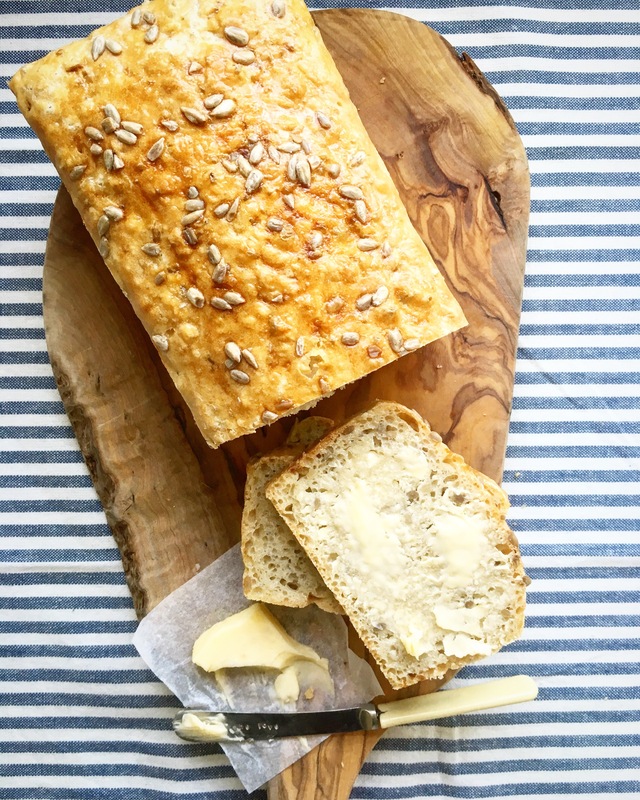 The moment when you finally taste a slice of warm, buttered bread that you’ve made yourself with your own fair hands and just a few basic ingredients is truly special. 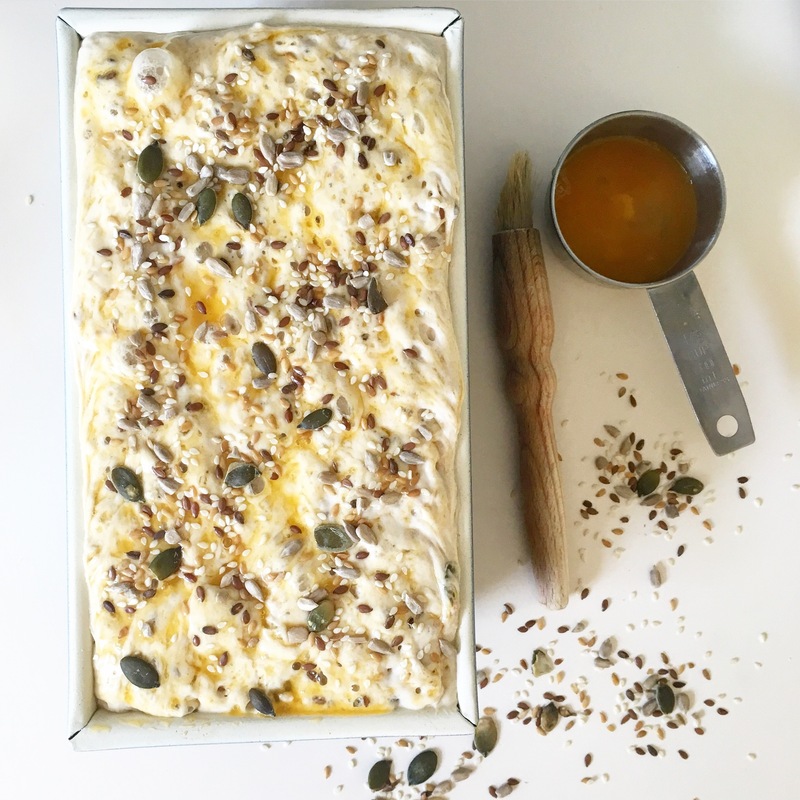 This recipe is for anyone who’s read the blog but perhaps has been put off by the long lists of ingredients or equipment required. From measuring out the ingredients to eating it’s a little under 3 hours with only about 10 minutes of hands on time, happy mindful baking! 4 tbsp seeds such as sunflower seeds or a seed mixture (optional) I used the Omega mega seed mix as the omegas are good for out brains! 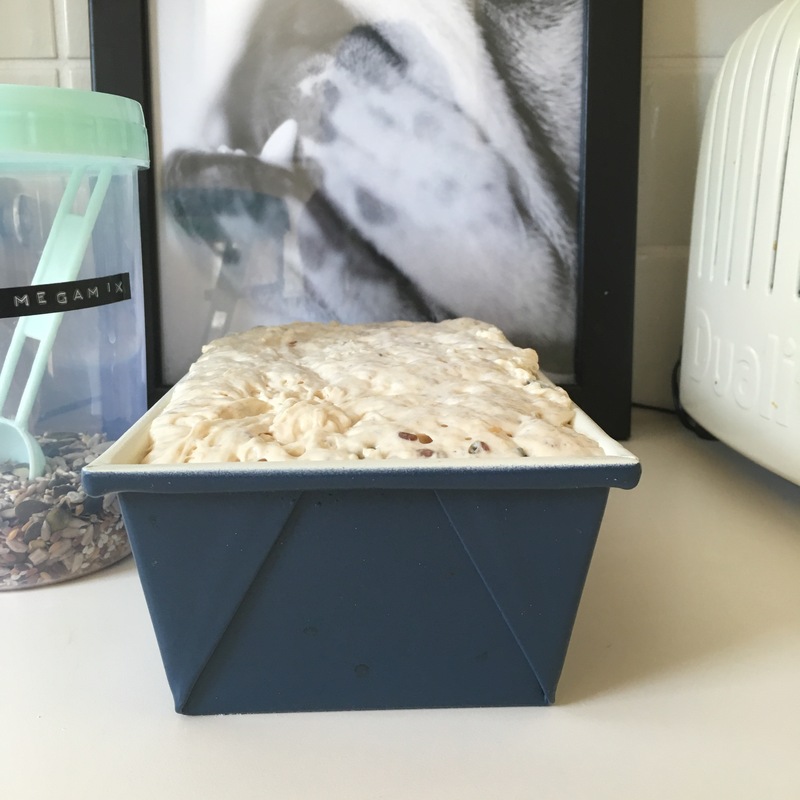 Lightly grease a 2lb loaf tin. Measure out 375ml of warm water into a jug. An easy way to get this temperature is by combining one quarter boiling water with three quarters cold. Stir in the yeast and honey until it is dissolved. If you are using fast action dried yeast, then just stir it into the dry ingredients. 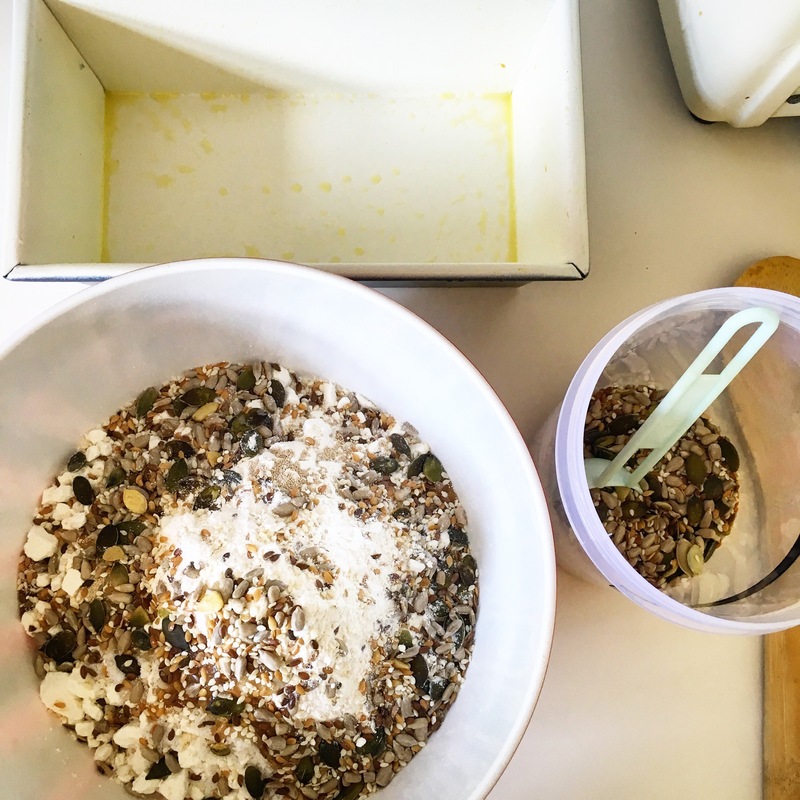 In a large bowl, combine the flour, 3 tbsp of the seeds (if using) and salt. Make a well in the middle and pour in the yeasty water. Mix with a wooden spoon until you have a soft dough that is sticky to touch, but not runny or lumpy. Lightly oil your work surface. 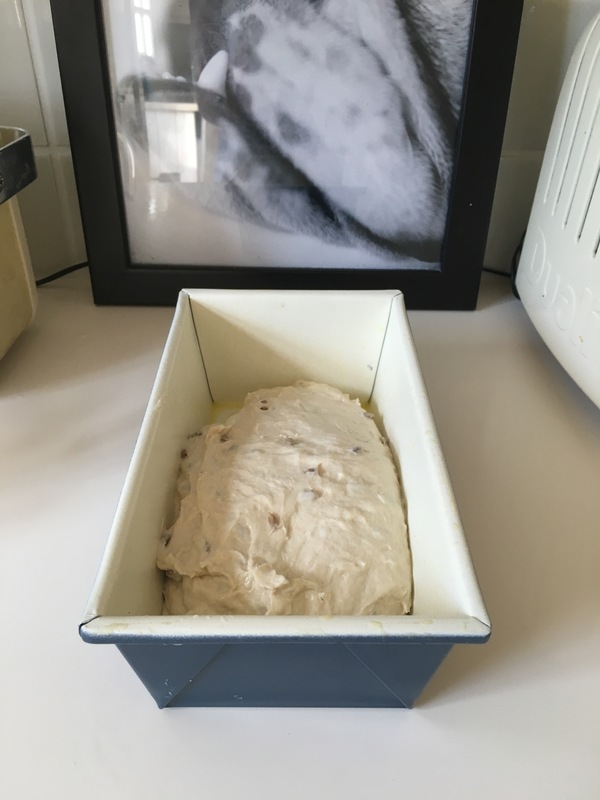 The dough is very wet so you have to work quickly and with oiled hands, you are more scooping than shaping, don’t panic, you just want to get it in the tin and once it’s in it will spread out and rise. I’ve posted a video to help. 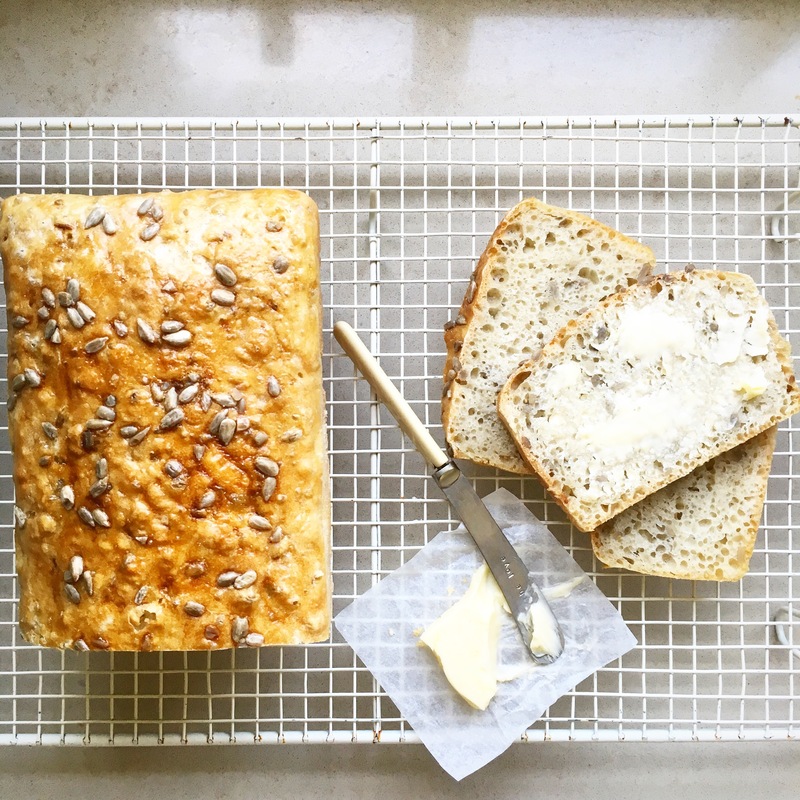 Oil your hands and either scoop the dough straight into the prepared loaf tin or roll it on a lightly oiled surface to shape. 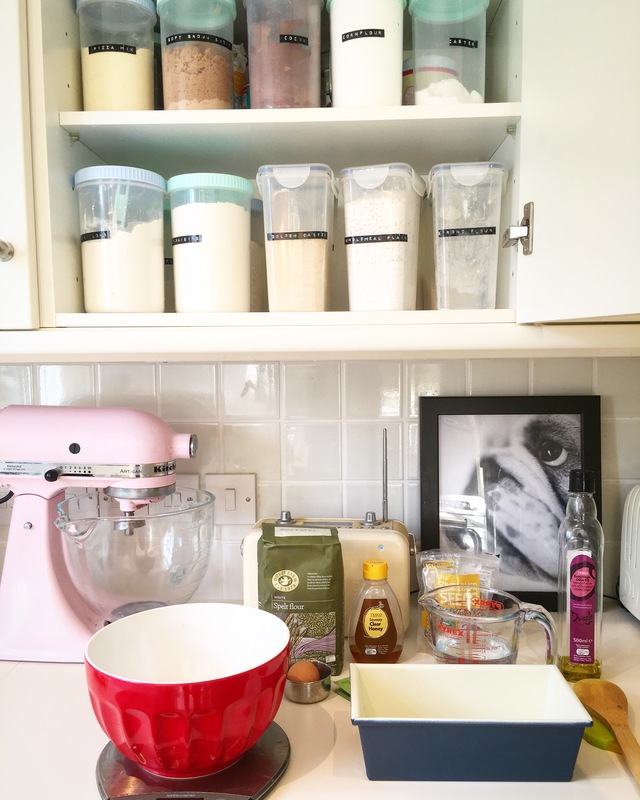 It’s not necessary to knead the dough. 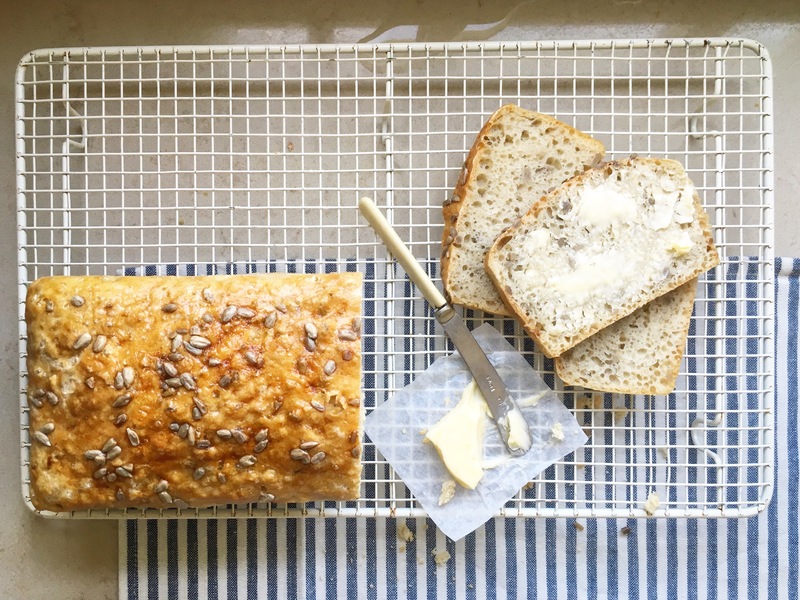 Leave the load to rise in a warm place (covered loosely with oiled cling film or a clean shower cap) for about 1 hour to an hour and a half, or until doubled in size: this will depend largely on the the weather. It will have risen about level with the top of the tin. Heat oven to 220c/200c fan/gas 8. Remove the cling film and brush with the beaten egg and then sprinkle with the reserved seeds. Bake on the middle shelf for about 30 minutes, or until it sounds hollow when tapped on the base. Cool on a wire rack.